Titanium dioxide (TiO2) has been used in optical coatings for the visible region for many years. 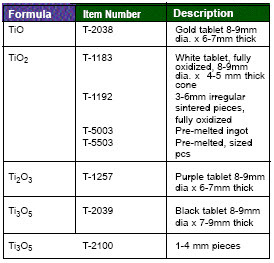 TiO2 has two particularly desirable qualities. It provides the highest index film material for the visible region, and it is hard and stable in combination with other oxides. Coating examples using TiO2 as the high-index material include beam splitters, cold mirrors and heat-reflecting mirrors, and AR on glass and polymer substrates. 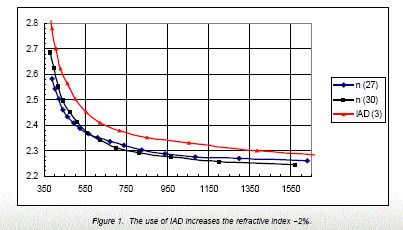 Absorption below 450 nm limits the applications to the visible and near-ir regions. When paired with SiO2 films, multilayer combinations totaling in excess of 50 layers have been deposited that show excellent durability and low mechanical stress because the tensile stress of titania layers is balanced by the compressive stress of the silica layers. Titanium and oxygen form a number of stable phases, the most practical being TiO, TiO2, Ti2O3 and Ti3O5. Any of these compositions can be evaporated and subsequently oxidized to the final stable phase, TiO2. The lower evaporation temperatures of the latter two compounds is an advantage becauseparticle ejection and strong outgassing is avoided. The resultant titania layers are composed of columnar microcrystallites with appreciable void volume and undesirable optical absorption unless films are grown under high -energy conditions such as high substrate temperature or Ion Assist (IAD) or by sputtering. IAD has been found to produce the highest refractive indices, yet the structure has neither the pure rutile or anatase long-range crystal phase. When heated above their melting points, titanium oxides decompose into suboxides and liberate oxygen. It is therefore necessary to prepare a dense homogeneous slug of melted material before beginning evaporation. The material should be conditioned as follows. Condense the starting material into a homogeneous mass by melting at low power, using a swept beam. Oxygen evolves during this process, leaving a black, oxygen-deficient melt. Repeated fillings of the crucible will be required unless a premelted cone is used as the starting charge. After the outgassing stops, the melt can be raised to evaporation temperature. The evaporant will re-oxidize reactively in the supplied partial pressure oxygen to form films of colorless TiO2. by resistance heating or electron beam. If Tungsten crucibles are used, some reaction between container and material results. For electron beam evaporation, Tantalum or water-cooled copper crucibles are recommended. Whenever any of the various oxide states of Titanium (see above) is evaporated, the vapor consists of various Ti-O combina- tions, which change in oxygen content as the evaporation proceeds. 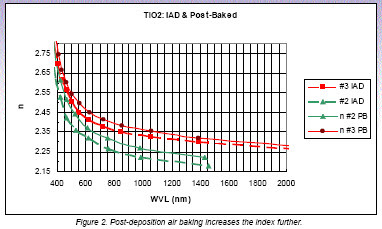 The refractive index of the deposited film thus is not constant because most Ti-Ox materials evaporate incongruently. Starting with Ti3O5 composition ensures that the only titanium species in the vapor is TiO, and the oxygen content in the vapor remains constant. Also the Ti3O5 composition has the advantage that it melts and thus a constant rate and pressure can be established for the duration of the deposition process. Rate of condensation ~3-5 Å/sec. Materion offers materials for evaporation as well as sputtering targets. Phases" H.K. Pulker, G. Paesold and E. Ritter, Applied Optics, Vol 15, No. 12 (1976), p. 2986-2990. 2. "Method of Depositing Titanium Dioxide Layers by Evaporation of a Molten Titanium-Oxygen Phase," H.K. Pulker, U.S. Patent 3,927,228.